Haptic interaction systems are an essential part of what is known as virtual reality (VR). Today, VR is a major tool in the field of product development. Today one can mainly differ between two different haptic systems: small desktop devices and large devices as used in aircraft or automotive manufacturing. Desktop systems offer a high mobility, but they have limitations concerning the factors achievable dynamics, work space, spatial resolutions and representable forces. Larger devices have much more working space and can display higher forces. However, those systems are mostly stationary and have a high weight, and the user is located inside the working space, which results in an enhanced injury risk. The newly developed haptic device combines the advantages of desktop systems and of large systems: it is transportable and it allows to display high loads with only little weights. This is possible due to a specific combination of serial and parallel kinematics – the special 3-axis kinematic structure. 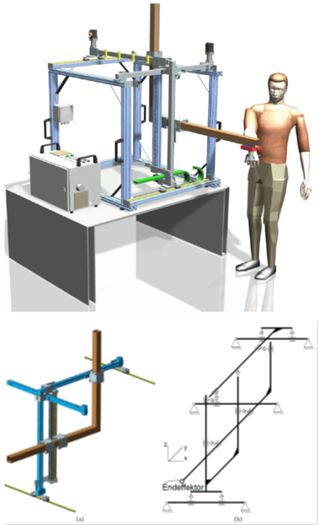 Due to a special arrangement of the kinematic structure it is possible to locate the user outside the working space and thereby reducing the injury risk. All in all, this development resulted in a mobile haptic device with high dynamics, large representable forces, a huge working space and an excellent spatial resolution. Schematic drawing of the haptic device (upper picture) and its special kinematic structure (lower picture).